If buying a car with a belt driven 4.2 Audi motor without proof of belt assembly replacement, don’t question… REPLACE IT. This goes a little further than just the belt. I believe the belt had been recently replaced in my latest find, but the assembly was in terrible shape. 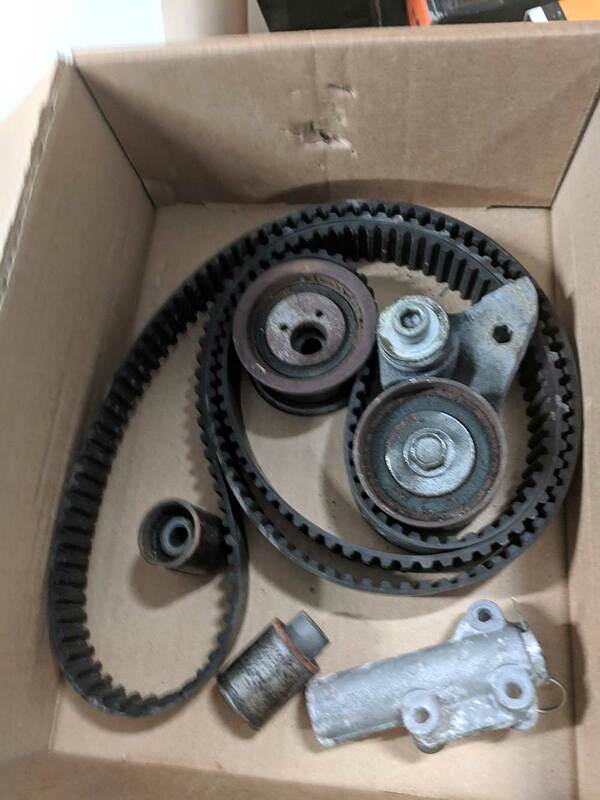 The pulleys were rusted and the bearings noisy, the water pump was seeping coolant from its seals, and the oil seals were leaking dinosaurs everywhere you parked. Lucky for me this was an older model with a ton of space in the bay that you are able to free up. The older models were designed in such a way that even though it looks complex, it’s very spartan and simple when compared to more modern offerings. Either way, we are about to get into the definitive guide to 4.2 Audi timing belt replacement. First, buy the parts you need. That means putting your exact Audi into the vehicle selector at eEuroparts.com and going to the engine>timing category. 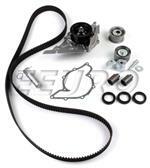 This kit is a great option for the belt driven 4.2 Audi V8, as it comes with a water pump gasket as well. Step 2: Drain the coolant. There is a drain on the drivers side bottom of the radiator. 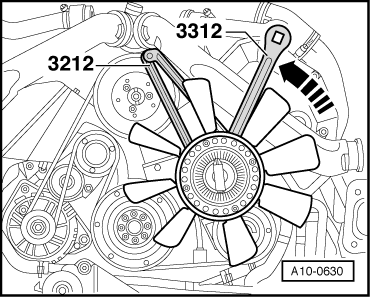 Then detach the radiator hoses as well. Be aware, you may need new hoses as these tend to rot out or be “mushy” over time. Step 3: Remove the Airbox and all the plastic engine covers. You will be surprised with the room you free up under there. This isn’t a bad time to replace the engine air filter as well. Step 4: Place car in Service Position. Yes, Once again, the front of the car comes off (mostly) to give access to everything needed to replace. It is about the easiest thing to do on these cars. 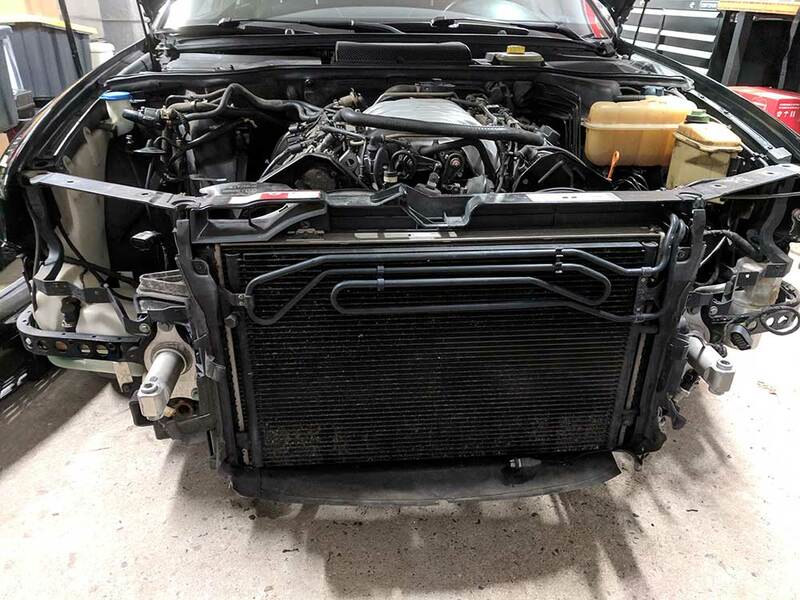 You need to remove the bumper fog light grills to access the headlight washer tube (if equipped) and the two bolts holding the main assembly on. That’s right…two bolts. There are an additional two small bolts holding the radiator frame to each of the headlights and two small allen head bolts at the far corners of the bay. Take these off first and then remove the two large allen head bolts holding the front bumper assembly on. Give it a good tug and you can pull it about 2-3 feet forward out of the way. Watch the hood release cable. You don’t need to but I removed it from the assembly to alleviate any stress. Step 5: Remove the viscous fan. You’ll need VAG Tool 3212 and a thin 32mm wrench. You put the spanner pins into the pulley and use the 32mm wrench to remove the viscous fan bolt. This is a reverse thread bolt, so turn it clockwise to loosen. Step 7: Move the engine to Top Dead Center (TDC). There is a mark on the crankshaft pulley and an arrow on the timing belt covers. Once there, verify the position by pulling the valve covers and checking the camshaft marks to their corresponding marks. If they aren’t there, you need to turn the engine pulley (by hand) over another 360 and check again. At this point you should see all four camshaft marks align with the marks on the cam caps. You will need to lock the crank and camshafts into position at this point. You will need the crankshaft locking pin (3242) and camshaft locking bar (T40005) here. 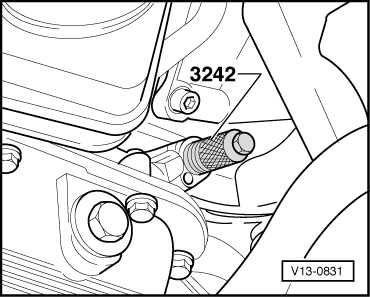 (Listed Above) The Crankshaft locking pin location can be found just forward of the starter area. You need to remove the bolt installed and tighten the locking tool into position. At this point, it is wise to put a piece of tape over the ignition and a sticky note on the instrument cluster to DO NOT START. Seriously…don’t do it. Step 9: You need to install the Camshaft Retainer Tool at this point. Use T40005 and align the holes…thus locking the cams in place. The reason I do this prior to belt removal is the driver side cam bank is loaded at this point and will snap into the place of least resistance…and maybe tap the valves on cylinder 5 into the piston. There is little chance of damage if this does happen…but there is a chance. Step 9: Use a 8mm hex socket wrench to push the hydraulic cam tensioner down enough to insert the locking pin. After the load is off the belt, loosen the eccentric pulley bolt to be able to get the belt loose enough for removal. Step 10: Loosen the camshaft bolts with the locking tool in place. Just leave a little space because you will be removing the camshaft gears. After the bolts are loose, remove the locking tool. Step 11: Using the gear puller, get the gears to break loose from the cams. Scary procedure, but after you hear a pop, the cams should be able to free spin. This is what you want. You are now good to remove the old belt. 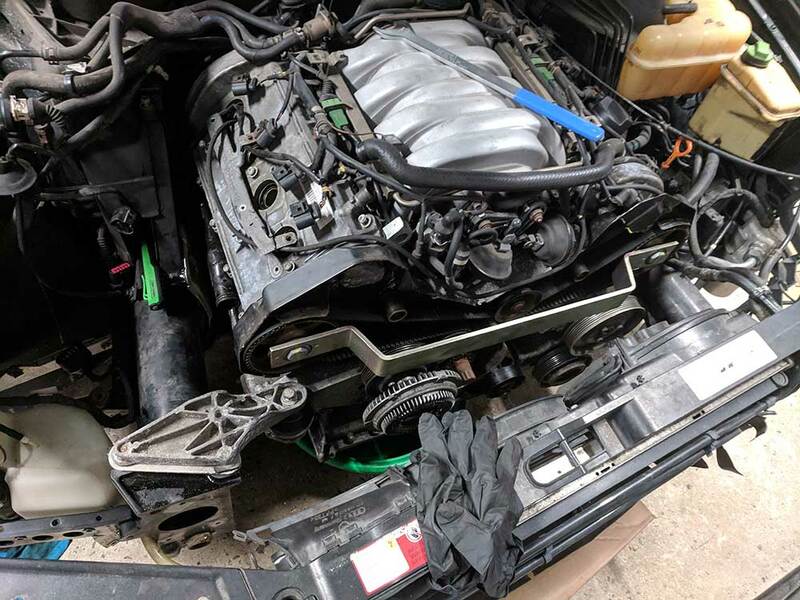 From here, you need to decide how much the car needs while things are apart, the amount of oil leaks (every 4.2 Audi has them…might as well get them all now), the condition of the timing chain tensioners, and if the oil cooler pipe needs replacing. At the very least, you should be replacing the belt, pulleys, thermostat, and the water pump. These are all accessible with the belt off, but only accessible with the belt off. DO IT NOW WHILE IT’S OFF. I chose to do all of the cam seals, cam caps, valve cover gaskets, timing chain tensioner gaskets (the usual source of large oil seepage on the 4.2 Audi engine), and timing chain tensioner pads. 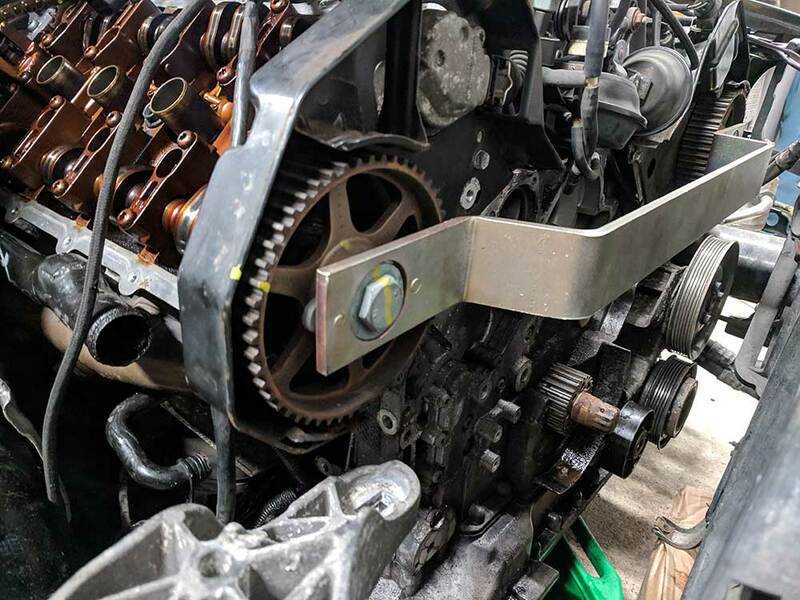 Doing anything with the timing chain tensioners requires removal of the cams which will be covered elsewhere as it is a procedure of its own. Stay tuned for the information on how to install the new parts and all the torque specs you will need…it’s a lengthy list. Hey Ryan, thanks for pointing this out. It was a server side problem that we can’t see from where we are on the network, as a result of a recent update we did to the blog. Let me know if they work now, thanks! pics are working now. nice write up!